The term Air Navigation Services includes Air Traffic Management (ATM), Communications, Navigation and Surveillance systems (CNS), Meteorological Services for Air Navigation (MET), Search and Rescue (SAR) and Aeronautical Information Service/Aeronautical Information Management (AIS/AIM). These services are provided to air traffic during all phases of aircraft operations (En-route, Terminal and Aerodrome). While Pakistan Civil Aviation Authority has been made responsible for the regulation and control of civil aviation activities within the country under Pakistan CAA Ordinance 1982, it has also been entrusted the responsibility for provision of civil airports and provision of Air navigation services under the same ordinance. ANS Division mainly comprises three directorates i.e. Operations Directorate, CNS Engineering Directorate and Flight Calibration Directorate. The provision of Air Navigation Services is the prime responsibility of Operations directorate with the support of CNS engineering and Flight Calibration Directorate who caters for the provision of required infrastructure and facilities for provision of such services. 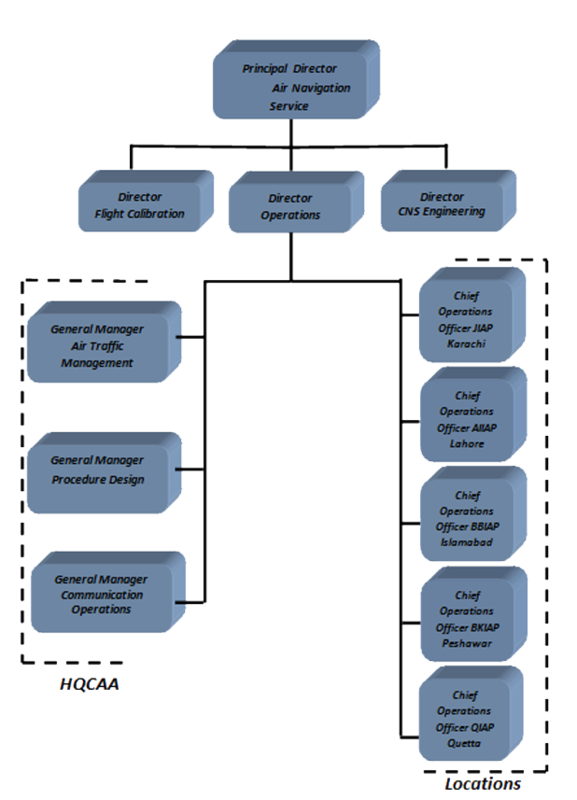 ANS Division is responsible for Air Traffic Management, provision of Search & Rescue Services, Aeronautical Communication, Navigation & Surveillance Services, Aeronautical Information Service and Flight Procedure Design services within Pakistan airspace whereas the responsibility for the provision of Meteorological services for air navigation rest with Pakistan Meteorological Department under a MoU.